I showed a preview for this quilt last week, but now it's all finished up, washed and crinkly! I pieced this using many of the Pure Elements Art Gallery colors. There are a few in here I don't love as much as the others, but I really wanted a colorful variety for this quilt. It's not always a bad thing to throw in a couple colors that aren't your favorites. The quilting is a series of interlocking roundish-rectangles. It was my first time trying it. Although I'm reasonably happy with it, I'm also glad it disappears fairly well into the background. I don't love it mostly because it was more challenging to get it smooth and consistent. It's not as perfect as I'd like and is one I will need to practice again. I used Squared Elements also from Art Gallery for the binding which, in my opinion, is one of the most perfect binding fabrics ever. When ordering my print for the binding, I couldn't decide so I ordered it in about six different colors. I knew I would use it, but now I might save those cuts for future bindings. The backing is a bright blue minky. I actually designed the block size with this minky piece in mind. The quilt is 56" x 72" finished and fits perfectly on a 2-yd cut. 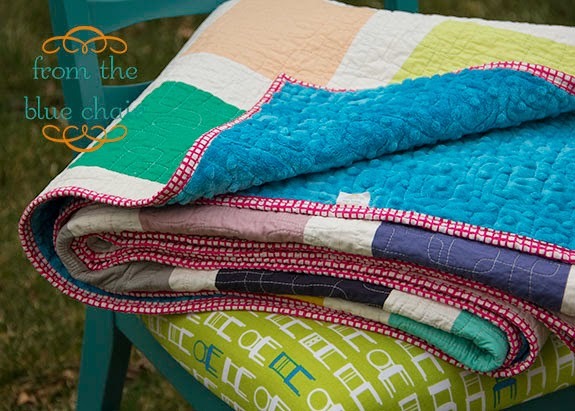 We're big fans of minky quilts around here. In fact the minky-back or flannel-backed quilts are the only ones that get any use by my kids. As much as I love designing my own quilt backs, there is something so nice and easy about simply sticking a perfectly sized back on a quilt and calling it done. As I mentioned in my past post about this quilt, my inspiration for this quilt was from a drawing made by my daughter. This is her pretend cell phone she drew (and uses). With the impatience of a teenager, she told me the other day, "Hang on Mom, I'm talking to my friend!" I'm not looking forward to the years of real cell phones. She even told my husband that her younger sister went into her download directory and started downloading Where's My Perry, but it would take all day to download before she could play it. Needless to say, we have a very computer-based household. I think the Where's My Perry statement was wishful thinking as I removed most games from my phone months ago when the kids constantly wanted to play them. I think my quilt is a pretty good reproduction of her art work! I am working on a pattern for this quilt with blocks in two different sizes. I just finished up a baby quilt top in the smaller block size that I look forward to sharing when it's quilted! If you might be interested in testing this pattern in a month or so, shoot me an email at fromthebluechair at gmail. I just love both the inspiration and the final result! 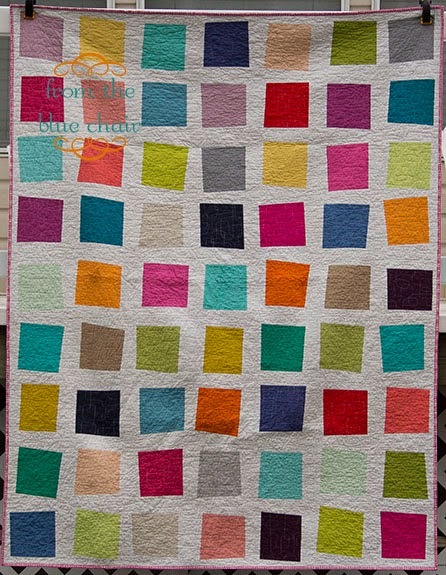 I think it is a great quilt and love the colors. 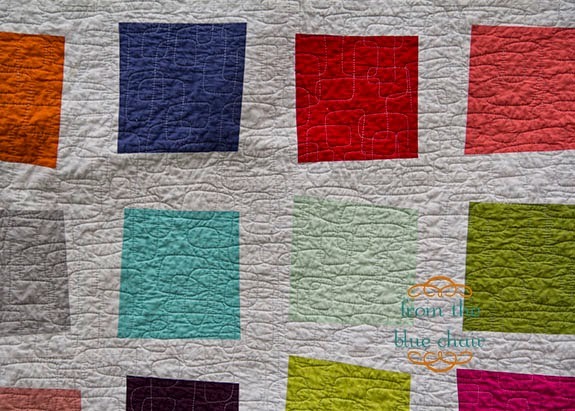 I have some Kona solids that I would love to try this quilt out with. Gorgeous. Just gorgeous! I love your quilting. I love this. So great. It reminds me od a snapshot quilt without all the fussy cutting. Very cute and the quilting is terrific. Kati,did you use a pattern for the quilting? My mother-in-law just gifted me her long-arm quilting machine and I'm trying to broaden my horizons with new patterns. I really like what you did, and I'd like to try it myself. Great work! I have yet to try free motion. I've used patterns up 'til now, but you've inspired me to try free motion. Thank you! Another beautiful quilt! And I love the quilting - it tends to be the thing that we're most critical of as quilters, but I find that after a wash any flaws aren't noticeable in the newly washed, crinkly goodness. Well done! It's lovely! 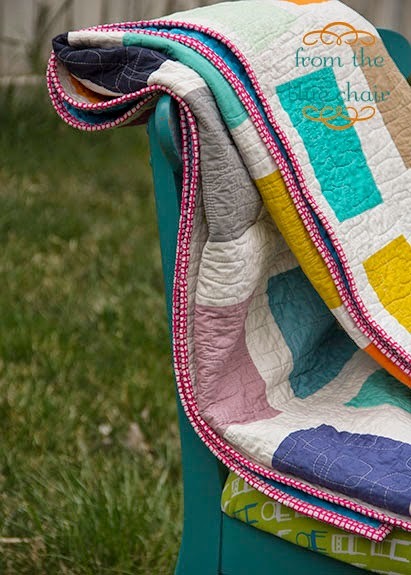 I think the quilting pattern is fantastic - it looks great to me! 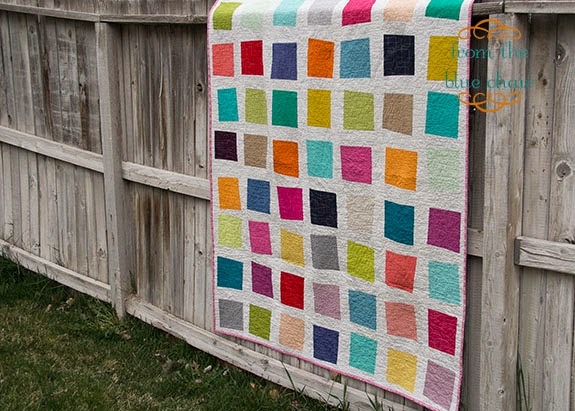 The story for this quilt is so cute! We too have a very computer-based household, and I can just imagine, how this situation with the cellphone happened! 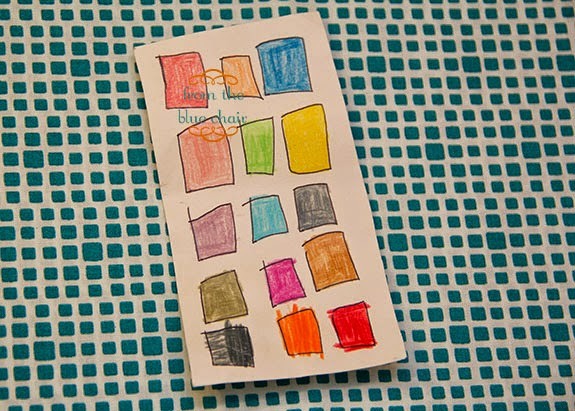 I love, how you turned the drawing from your daughter into a quilt! What an affirmation, making a quilt from your daughter's drawing! Oh I LOVE that you interpreted her artwork! Nice interpretation!. Love how all the colors work together and are bright. Love the quilt! I too wondered if quilting with minkee backing was harder. And the pictures look like you quilted with clear thread?? Did you prewash the top? Did you use batting? I love the crinkly look.